One of the first accurate maps of the California Coast around San Francisco. Carte Particuliere de la Cote du Nord-Ouest de l Amerique reconnue par les Fregates Francaises la Boussole et l Astrolabe en 1786. 3e. Feuille. This is a fine example of La Perouse's important 1787 mapping of the California and Oregon coastlines from Port de Monterey (Monterey Bay) northwards past the Port de St. Francois (San Francsico Bay) and Cape Mendocino to Cap Rond (Tillamook Head, Oregon). Though minimalist this map exhibits one of the most important early surveys of San Francisco Bay. La Perouse spent roughly 10 days surveying San Francisco Bay making numerous improvements over Jose de Canizares' 1776 Plano del Puerto de Sn. Francisco. Skirting the coast, La Perouse also identifies a number of important landmarks including Cape Mendocino, Port de La Trinite, Cap Blanc (Cape Blanco), and others. The route of the La Perouse expedition is noted as it skirts the coast. 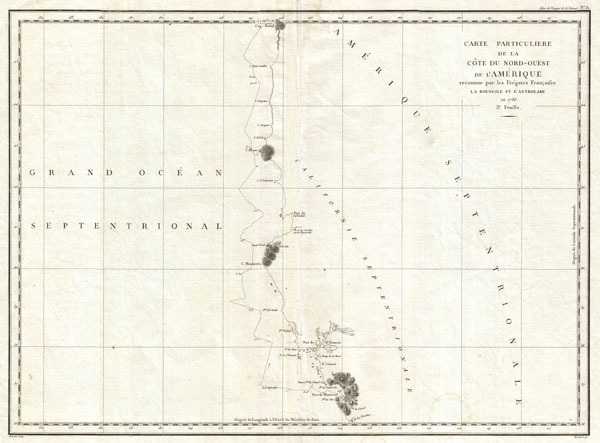 In its day the importance of this chart went largely unknown for, though the survey work and original engraving date to 1786, the atlas of La Perouse's discoveries was not officially published until 1798, by which time other more advances mappings of the region had reached the mainstream. Nonetheless, this map is a vital addition to any serious collection focusing on the cartographic development of America's western coast.